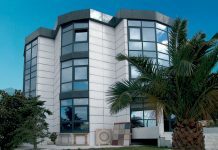 U.S.A. is the top importer of finished marble products globally. Which are the States with the highest imports during the last decade? 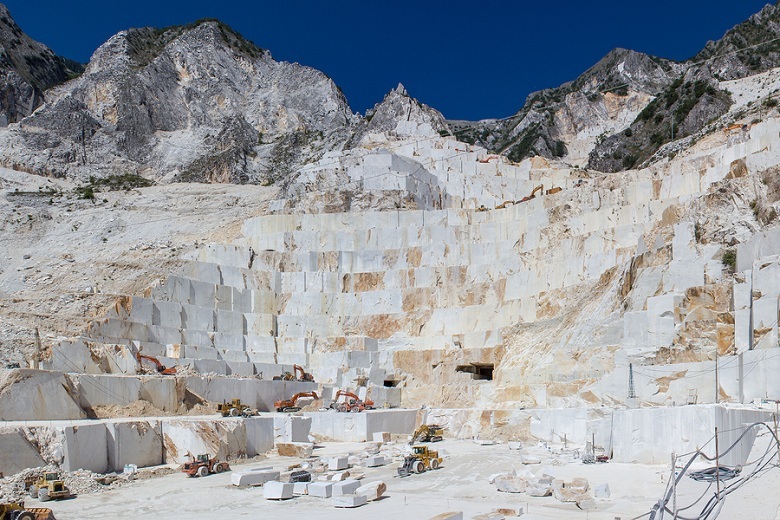 Stonenews.eu, after studying the statistical results of the United States Census Bureau, is presenting the U.S. states with the highest import value of finished marble products during 2008 – 2017. 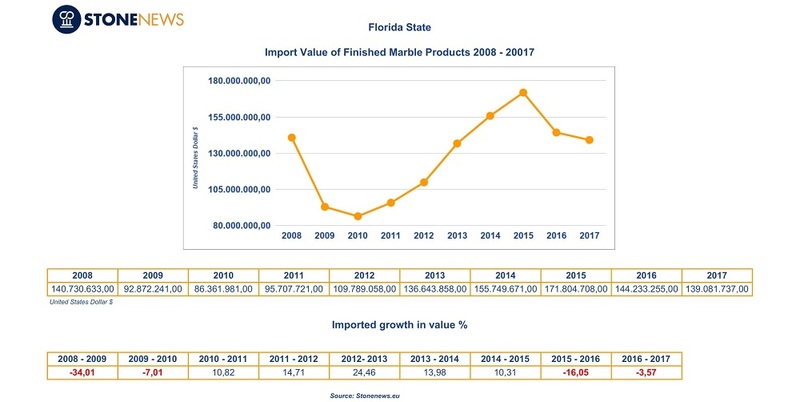 The figures give a clear picture of the dynamics and the growth of finished marble products imports of these States after the outbreak of the U.S. economic crisis in 2007. An interesting fact that came out from the data analysis is that the richest and most populous States are not necessarily the biggest importers of finished marble as well. California is the richest and most populous U.S. state with the highest import value of finished marble products. Below you can find data of California’s import value from 2008 to 2017 in detail. As we can see, the highest import value was in 2008 and despite the reflation, it never made a comeback, showing that the economic crisis had a decisive impact on imports. 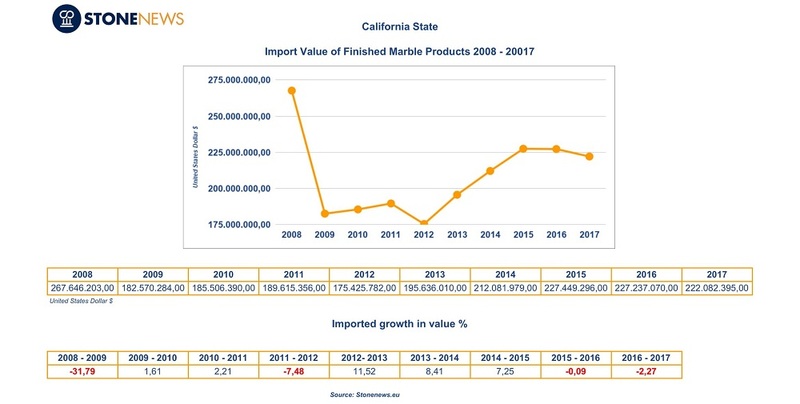 However, California is still by far the main finished marble products importer in U.S.A.
Florida, despite being the fourth richest and the third most populous state, is the second biggest importer of finished marble products in U.S.A. Below you can find data of Florida’s import value from 2008 to 2017 in detail. As we can see, Florida’s imports started to recover in 2011 at an extremely high rate until 2015, when they reached a record high for the decade. The upward trend stops in 2016 when imports started to drop significantly while 2017 concluded with a decrease. 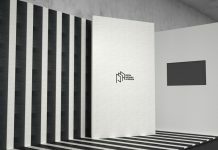 Texas is the second richest and most populous state in U.S.A. and the third largest importer of finished marble products. Below you can find data of Texas’ import value from 2008 to 2017. As we can see, Texas, following the large decline of imports in 2009 and the continuous ups and downs till 2011, made a comeback in 2012, showing a steady increase since then. In 2016, imports were reduced while in 2017 they recovered, reaching a record high for the decade in 2015. 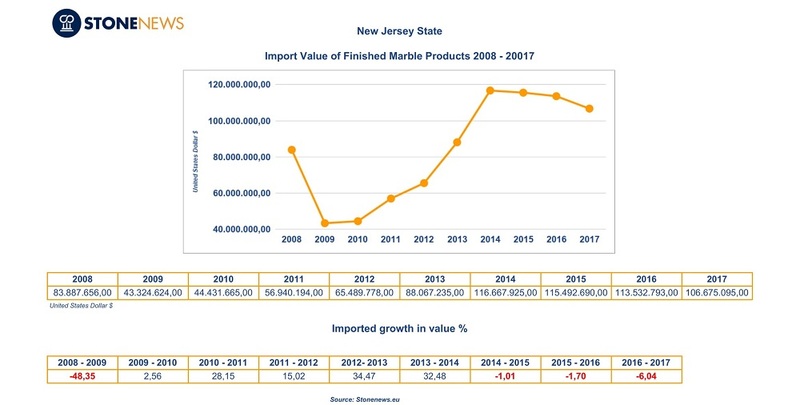 New Jersey is the eighth richest and the eleventh most populous U.S. state and the fourth largest importer of finished marble products in U.S.A. New Jersey’s location gives it the advantage of neighboring or being close to big and important U.S. cities such as New York, Philadelphia, Baltimore, Washington. Below you can find data of New Jersey’s import value from 2008 to 2017 in brief. As we can see, New Jersey’s imports, after their great fall in 2009, they have been rising in a really high rate until 2014, when they reached a record high for the decade. In 2015, imports are reduced while the rate of decline increased significantly in 2017. New York is the third richest and the fourth most populous state and the fifth largest importer of finished marble products in U.S.A. Below, you can find data of New York’s import value from 2008 to 2017 in brief. As we can see, New York’s imports, after the 2008-2010 decline, were constantly increasing from 2011 to 2014 just to stop in 2015 and 2016, while in 2017 they recovered reaching a record high for the decade. 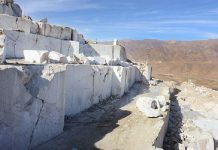 In a conclusion, it is worth saying that the Washington, Ohio, Oregon, Luisiana, South Carolina and Kansas states are increasing their finished marble products imports in an extremely high rate.